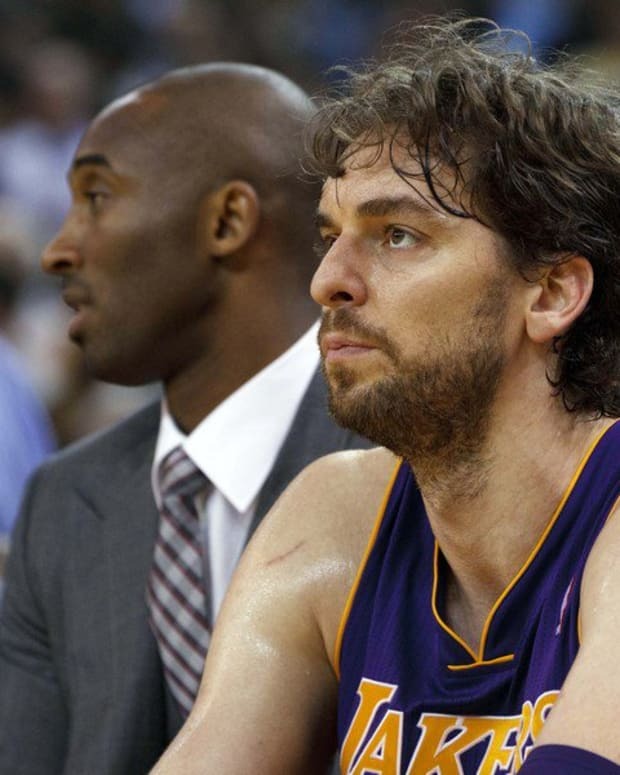 Mitch Kupchak has made it pretty clear that he won’t trade Pau Gasol any time soon. Be it because the Los Angeles Lakers genuinely want to see how playing with Steve Nash impacts his production, or simply because the offers they have fetched for Gasol’s services thus far have been unimpressive, team brass is standing pretty firm on not moving their talented power forward. That being said, rumors are still continuing to flow. And seeing as the Lakers have already technically traded Gasol once (last year, in the infamous vetoed Chris Paul deal), you can’t really fault folks for presuming that they will do it again. Minnesota continues to make the most sense as a landing spot for Gasol, since he&apos;d slot in so nicely alongside countryman Ricky Rubio and a cranky Kevin Love, but the Wolves don&apos;t have the proven big man with deep range to clinch a one-to-one deal with L.A. If Nash comes back and Pau looks as lost as he did before knee tendinitis shelved him for the past six games, finally convincing L.A. to end the Gasol guessing games once and for all, perhaps there&apos;s a multiteam scenario down the road to fill in the gaps for the Wolves and Lakers. Sources say the Lakers and the Dallas Mavericks would love to import Calderon, but neither has the spare assets to easily swing a trade for a player making $10.6 million this season with a 10 percent trade kicker in his contract. Forget having a proven big man with range – the Wolves literally have nothing worth trading for on the roster outside of Rubio and Love. There is no way, even if they just wanted to dump Gasol’s salary, the Lakers would agree to swap parts with David Kahn. The second deal, the one involving Toronto, may be more realistic. At the moment, the biggest hang-up with that one appears to be Andrea Bargnani’s decreasing trade value. He wasn’t that coveted of a piece to begin with, and him getting injured doesn’t exactly enhance anyone’s view of him. Gasol is due to return sometime this week. Nash may play in the Chrismas Day game. Ultimately, how the two mesh will determine not only Gasol’s future with the Lakers, but also how much the team is able to net for him if it decides to pull the trigger on a trade.